What is it? 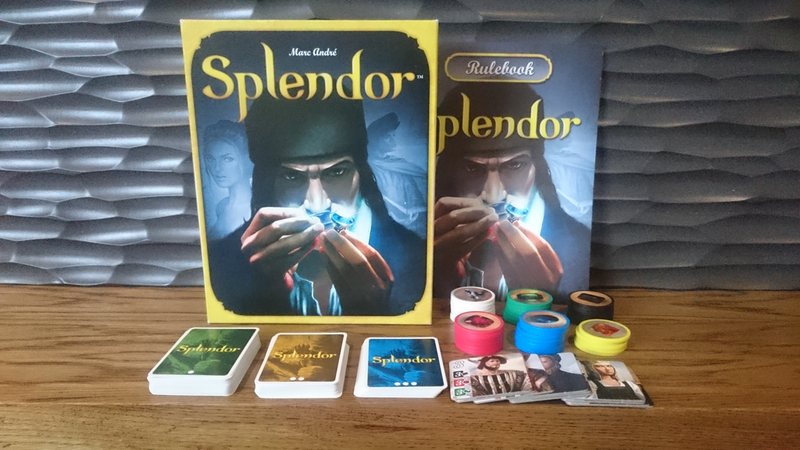 Splendor, the game of outmaneuvering fellow gem merchants to gain the riches of the jewel trade. Be the first merchant to reach 15 "Prestige Points" and win! Apologies, you were lured here by the promise of battle through bad Photoshop skills, which you will not find here (no the Photoshop work is still terrible). But, what you find might be very worth your while, so please stick around. Prepare for (mostly peaceful) glory! 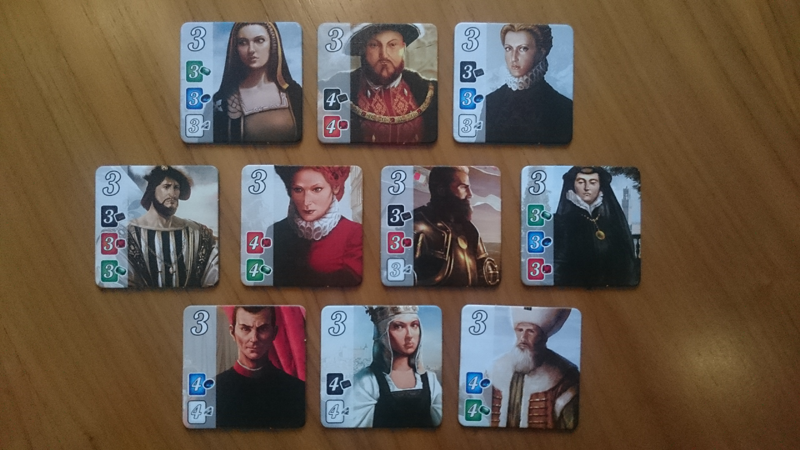 Splendor, a runner-up in the 2014 Spiel des Jahres (game of the year) awards, sees each player fulfill the role of a gem merchant in the Renaissance period. You will start your trade by mining for goods (buying development cards), then transporting them to cities where they shall be sold (buying more expensive cards), and finally selling them to the nobility (buying even more expensive cards). 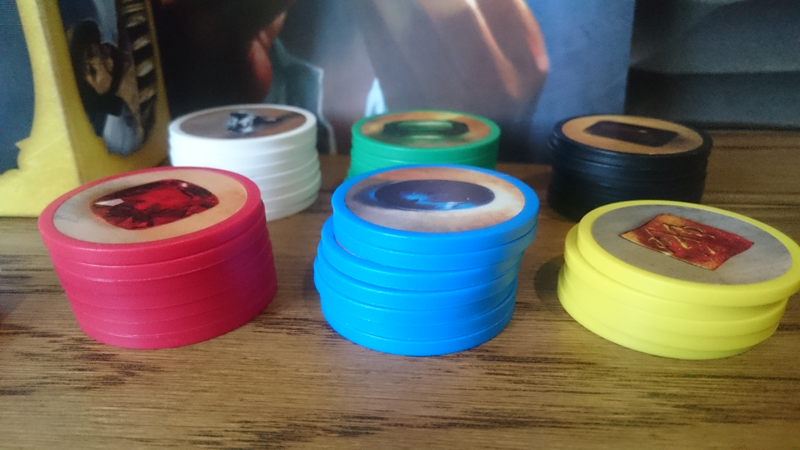 Players score “Prestige Points” by purchasing these development cards (with varying point values) with gems which are represented by poker-style chips. The clever part is, that by buying these cards, future purchases become less expensive. For example, in the image below I want to buy a ruby (red) development card (worth 2 prestige points), costing 1 diamond (white), 4 sapphires (blue) and 2 emeralds (green). Previously I have purchased 3 development cards – 1 each diamond, sapphire and emerald. We subtract those cards we own from the cost of the ruby card, so that the balance owed is 3 sapphires and 1 emerald, which we pay with our chips. You can see that you stack similar gem cards for bigger discounts. Take chips – either 3 different coloured ones, or 2 chips of the same colour (providing there are at least 4 chips of that colour left). Note that you may have a maximum of 10 chips at the end of your turn. Reserve a development card – grab any card from the field and place it in your hand and take 1 gold chip (which acts as a joker when purchasing cards). You may have up to 3 reserved cards. Buy a development card – either from the table or perhaps from the reserved cards in your hand if you have any. Sounds simple? Of course it does, but then not all development cards are created equally – there are three tiers of cards available, with a noticeable increase in cost from tier to tier, as well as a similarly-scaled increase in Prestige Point rewards received from purchased cards. Purchased cards get replaced immediately from each tier’s dedicated draw deck. Traditionally, gameplay would revolve around first buying tier 1 cards, then using those in conjunction with chips to invest in the second tier, and then finally hitting the big time in the third tier. I say ‘traditionally’ because there is a variety of strategies to win the game, so be ready to deviate as the game changes. But Splendor is not just worrying about your own economy. Feel free to buy or reserve cards that would benefit a rival, hopefully slowing their point production. Hoarding specific chips to keep them away from others is also a viable option (sis Jason). Give them nothing, but take from them everything. And then there are the randomised Noble tiles, which grant Prestige Point bonuses only to the first player that manages to own a specific set of cards, so be prepared to compete to gain the respect and honour of these nobles. As for components, the artwork on the cards and tiles ranges from functional to fantastic, but the real star here are those awesome chips. They are thick plastic chips, but underneath the stickers on the chips you will find a metallic centre, giving them a perfect weight and feel. Splendor is not without weak points, but luckily they matter very little to the overall enjoyment. The main issue is the implementation of the theme and maybe if I were to really nitpick, I could point out that the game would fit in a box half the size of the current presentation. 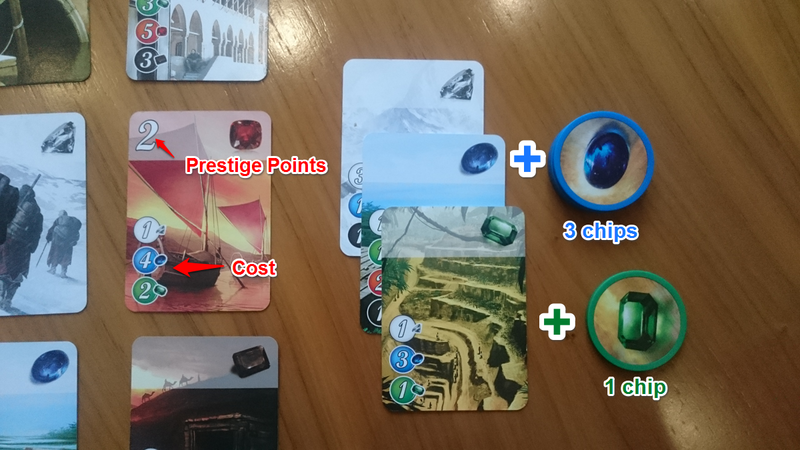 For me the appeal of Splendor is making tough choices on the fly: Which cards present good value? When do you start buying from higher tiers? When do you abandon your initial plan if the cards on offer are not right? Do you risk leaving cards for later and hope rivals don’t purchase them? 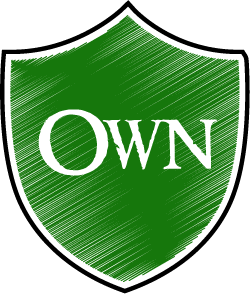 With the ever-changing playing field, you have to alter your strategy constantly. This can cause a bit of AP but nothing significant. Though the game does have a bit of luck attached to it, it definitely favours those who plan ahead. 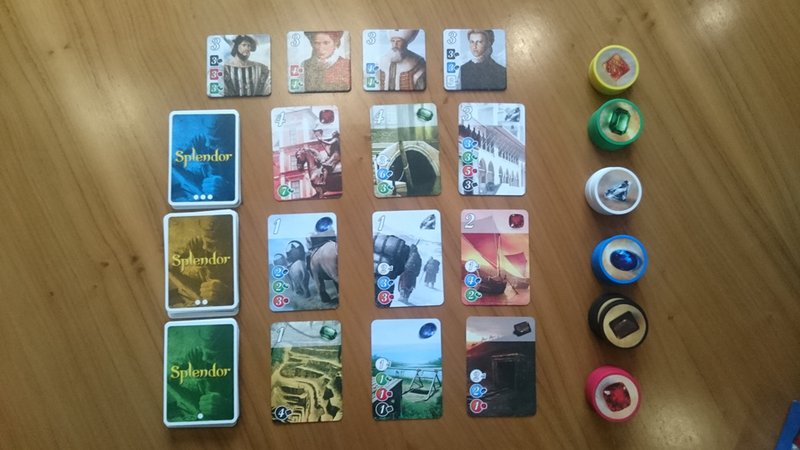 Despite the lack of theme, Splendor is one of those titles that ticks all the right boxes for me - it’s stupidly easy to learn AND teach, features great art and components, and gameplay scales fantastically for 2-4 players. Also, as somebody that doesn’t always have a lot of free time, for me a 30-minute game fits nicely into that space between playing a filler and a 2+ hour epic game.